No Ice Buckets for me, Thank you very much. 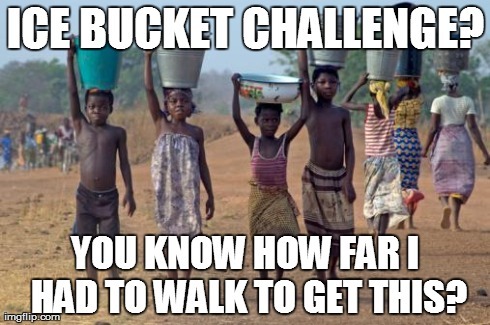 So there’s this viral campaign doing the rounds: you either throw a bucket-full of ice water on yourself or donate money within 24 hours of being challenged. The deal? You either donate, or you suffer for not donating. The funds raised in the challenge go towards research for the condition – ALS, or Amyotrophic Lateral Sclerosis. While this is definitely appreciable, here’s a fact: it drives home a very painful fallacy: that it is the charities that are good at getting the money that will be successful, not necessarily the ones that are doing good work. Agreeable that ALS is a debilitating condition; agreed that people with the condition suffer unimaginably: but it is also a very rare condition. This is not to mean that we shouldn't focus on it - but why are we focusing on it at the cost of the some very pressing needs? World over, there are communities without clean water (and here we are, throwing buckets of iced water over ourselves), without access to basic medical and health care facilities (and here, we’re putting a lot of money into a rare disease that could also be equally useful in addressing epidemics and very curable diseases that simply don’t have resources to address), without food (and here we're donating by the hundreds when we could just buy a few meals and donate them each week) and without peace (while we are happily throwing ice water on ourselves, people in Gaza and Syria sit smack centre in war). The idea of treating philanthropy as a game and letting it go viral is both unfair and inappropriate for any cause. It leads to idle armchair action that really goes nowhere: and ultimately dies out like every other fad. The Ice Bucket Challenge is typically an institution: an institution that brings celebrities, banking companies and social media – and there are a lot of flaws in the system. And in that institutional structure, it is just “stunt philanthropy”, and very uncomprehending armchair activism. It is of course agreeable and understandable that everyone has limited time, resources and accessibility to take overt action. Settling for the armchair is not wrong – but what use does anything serve if you’re running after a fad, knowing next to nothing about a cause you are told you are supporting, and potentially ignoring the more pressing concerns while you’re following mob mentality? In goading you to follow what everyone else is following, this is a fad – a fad that also makes you feel terrible for caring for something else that is more pressing, a fad that you don’t want to be left out of. When everyone and their neighbour is feeding into the fad, and you stay out of it, you’re easily told that you lack empathy for the cause. The irony is that few among the lot that take to the challenge actually know what they’re supporting. …. And now, this #IceBucketChallenge. Throwing a bucket of ice water on yourself numbs you for a moment’s worth of time. And that’s supposed to let you understand how someone with ALS feels. 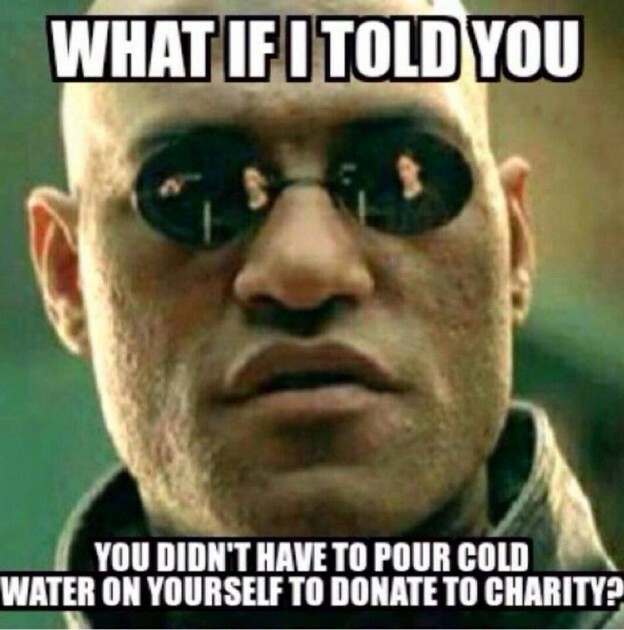 What a travesty – you suffer for a moment because you can’t donate, and somehow that makes someone with ALS feel better? 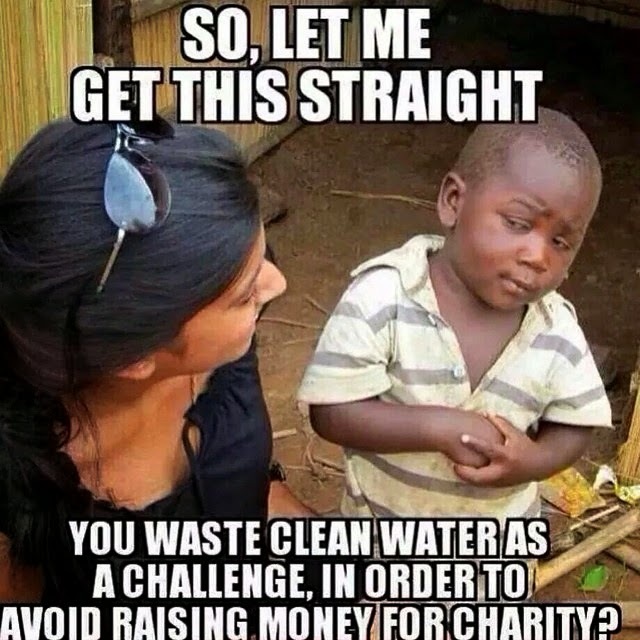 Here’s what's even more alarming: when trend-setters and influencers decide to take the challenge instead of donating, it sends out a very dangerous message, to the effect that they’d rather throw water on themselves instead of parting with their money. Although – I hasten to add – many of them have donated, too - but not many see or hear about that, or even pay heed. 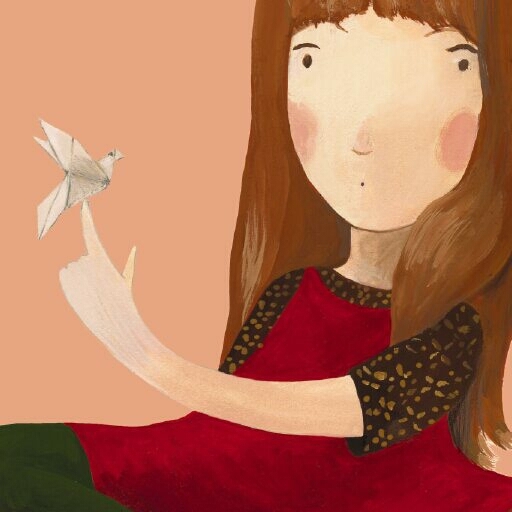 The message that goes out purports a need to connect guilt and taking action. A fad is the worst way to go about awareness for a cause because, (a) guilt should not be a basis for sustainable effort and (b) one minute to feel what people with ALS feel for a lifetime is “suffering” is hardly fair on those that live with it for a lifetime. Not to forget the many memes doing the rounds on social media (something about Kate-Winslet-as-Rose “nominating” Leonardo-Di-Caprio-as-Jack for the Ice Bucket Challenge and an astonished Keanu-Reeves-meme asking "What if the Ice Bucket Challenge is just a ruse by one guy who had ALS and his dying wish was to see as many girls in wet T-shirts as possible) that are insensitive to those with the condition. The whole argument is quite like the “finish your food because there are hungry children in Africa” – how does you not eating a full meal further deprive a hungry child anywhere? Here’s the deal: you don’t need to dump water on yourself to donate for a cause. Heck, you don’t need to do anything besides donating, to donate for a cause. If you can’t donate because you think it isn’t worth your penny, you may need an attitude adjustment. If you can’t donate because you can’t donate, you can always volunteer your time and effort. So. Um… Is it just me that thinks that this whole Ice Bucket Challenge is insensitive?